Is The Field Agent App A Scam, Or Legit Fun Tasks? Last updated on January 24, 2019 By Nat 2 Comments This post may contain affiliate links. We appreciate you supporting Rags To Niches! Full disclosure here. Are you looking for a way to earn a bit of money for completing simple tasks? Then its possible Field agent may have the answer. If you found my review in the search engines, or via social media, then you’re likely feeling a bit suspicious of this app and have wondered if it’s legitimate. Well, I’ve looked into hundreds of make-money opportunties online, including various smartphone apps. Some of which have clearly been a scam. Is Field Agent a scam? No. In this case, it is a legitimate opportunity. Albeit, a very small one. I downloaded the App myself and this is what I made of it. Available On: IOS, Android, Ipad. Verdict: Legit, but how much you can get will depend on your location! What Is Field Agent App About & How Does It Work? Download Field Agent on your mobile device. Answer some profiling questions, (name/age/location etc). Jobs within a certain radius, (up to 90 miles at the time of writing) will be located. If you want to participate in a job, you accept it. You are given a set amount of time to complete your job. Send your results back to Field Agent. This company is collects data for different clients using the app, by broadcasting various tasks and mini-jobs to their “agents,” and recording the results, which they report back to their clients. With the look of the App, the whole thing has a “special agent,” kinda vibe, which some people may find appealing. The jobs may something very simple, such as taking a photo of a store shelf, finding a product within a store, or completing a survey. Field Agent will ask for your location and send you tasks based on that. They’re sent out first come/first serve though, so you have to be quick if you want to snap up a task. Signing up was really quick to do. You fill in some details such as your name, country, email and date of birth, whether you have children, education and household income. After that, it asks you about your shopping habits. Where you buy beauty products, where you buy groceries, where you by DIY products. It also asks you if you would be able to take photos, or videos, during some of your jobs. You can opt out of either photos, or videos, (or both) if you choose to. Unfortunately, after I had gone through the process of filling out my profile, there was only one “job,” open to me. But it wasn’t really a job at all. It seemed to be a survey related to shopping, where I would be entered into a prize draw for £100 for completing it. I should note, I could look for jobs up to 90 miles away! Still, there wasn’t anything else available to me at this time. I was not overly surprised at all. My assumption signing up, is that there are likely to be the most opportunities in a large town or city. I wasn’t interested in the survey just to enter a prize draw, so I left it and will see if anything else pops up. 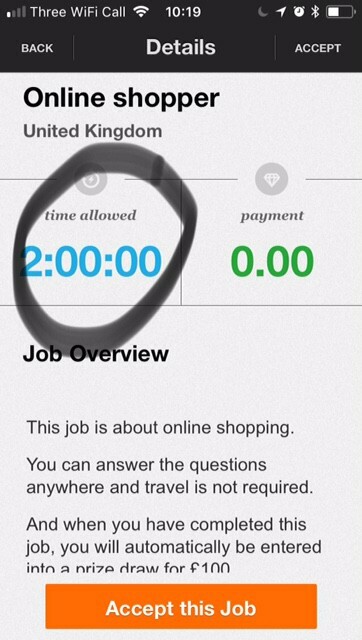 If you were interested in a job, you’d just click to accept the task and will be given a certain amount of time to complete it. In the case of this survey, I saw they had given me two hours to complete it. Obviously, it wasn’t going to take two hours to complete, but presumably I just needed to do it in that time frame. Have you had many jobs avaialble with Feild Agent? Let me know in the comments. How Soon Do You Get Paid? Once you have completed a task and it’s all been uploaded, you should see payment in your Field Agent account within 48 hours. You don’t need to withdraw this, you can leave the money accumulating in your account, until there is a decent enough sum to withdraw. You can then withdraw via Paypal. If you don’t have a Paypal account, it’s possible to get a bank transfer. Well, as I’ve shown, this will really depend on a variety of things. Probably most notably, where you live! If you live out in the middle of nowhere, I imagine you’ll just be sent survey type offers. In which case, I really wouldn’t see the point in having the app. If you live in the middle of a big city, there may be lots of offers. But there will also be more competition and the work may disappear far more quickly. As a side note, I saw someone in LONDON (uk) say they were hardly getting any jobs!! So, who knows where all these jobs are actually posted that everyone is doing. It also depends how many clients Field Agent has at the time. They will naturally have more or less at different times and that’s not something you can predict. What Is Your Field Agent Score? When you first join, you’re given a score of 85/100. As you progress and complete jobs, this score will go up and down depending on clients feedback of your work. If you manage to do well and get a higher score, you’re more likely to see higher paying opportunties. How Much Can You Make Per Task? For some tasks, you aren’t offered any money at all… Just a sweepstake entry, like I was! I have seen reports that you can make up to around $2/$12 – or between £3-£9 in the UK. From my experiences of rewards sites, offers and apps, I will bet that most taks would actually pay significantly less than that. I’d assume around $3/£2, but that is a blind guess – as I have not been sent any “jobs,” that actually pay anything! What’s the best task you’ve been sent by Field Agent App? Let me know in the comments. There are various complaints about this App online. Having read through a tonne of them, I have narrowed the complaints down to some of the most popular. Complaints that jobs are easily rejected, some of which may have costed the “agent,” something to complete in the first place. Walking into shops and taking videos or photos of products makes some feel uncomfortable! That it can create fun tasks for kids to do, that’s different to the norm. Easy tasks that you can do on the go, you can also switch locations wherever you are. Some claim to be able to complete tasks daily, (some locations must have a lot more available). (it’s not been worth mine). Field Agent is a good looking App; which is easy to navigate and quick to get started with. It’s something that could have potential, if you have plenty to choose from job wise. The problem really seems to be, there just aren’t enough opportunties available. While Field Agent is legit and may be a bit of fun for some people – there are some real downsides. The lack of jobs being being the most obvious, low pay out, (for the most part) and having to travel to locations in some cases to do the job, (which could cost you). The ideal scenario would be that you pick these jobs up, as you’re already in town and it can just tag on to your day easily. There is also the slightly grey area of potentially having to take photos and videos in a public place, or within businesses. Which I guess could cause more than a raised eyebrow in some situations. Plus, there have been some additional complaints regarding bugs & glitches, or not being paid for the tasks completed. Due to having zero jobs available to me, I can’t fully understand how worthwhile this could be as a money-making side hustle. However, I do resent there being any surveys on this app. Completing a survey for an entry into some sweepstake, (that could have 50 million entrants for all I know) is NOT a job. If you’re pretty frustrated about the lack of opportunities to make money in this way, I totally hear you. It seems like bloggers and websites all over the place are promoting opportunities similar to this – but how many of them actually spend any time on these platforms day to day? It’s like all the bloggers recommending dozens of survey sites, when they’re earning five figures a month!! (Yes, there are even bloggers making six figures a month, if you didn’t know). Would you be completing surveys if you made five or six figures a month? Well, I’m not making that kind of money and I still don’t spend my time answering surveys, or doing mini tasks on apps to make money. I participate with them to review them and I have a genuine interest in discovering if any are really worth your time – because, for the most part, I don’t think they are! I’ve been on a bit of a mission, hoping that one day…somewhere... one of them may actually discover a bunch of really worthwhile mini opportunities that are simple to do. Paid surveys, some people enjoy them. For me, they largely aren’t worth the time. Paid mini tasks like what Field agent offer COULD have potential, but only if there were enough opportunities to make it worthwhile, (which, for most people, there doesn’t seem to be). I go for things that are minimal time and effort for the reward. OR a little more time and effort, but a higher reward. So, Swagbucks has a browser extension, I can use that as a search engine and get points and so, I use that. There is also cashback on there, which I can use and get points and I’m alerted of cashback offers while I’m online, that I can activate at a click of a button. I use an app to get cashback, by taking photos of my receipts. Takes me no time. Why not. I test websites online, because they can pay $10 a 20 minute test. WAY better than surveys. A little can add up to a healthy amount in time. But ultimately, if you want to make MORE online then, the pocket money sites won’t add up to a decent side-hustle. You need to be focused on the long-term, if you want to make decent money online. Quick fixes won’t get you there. Have you made money with Field Agent? How did you find it? I’d love to know! To be honest with you, I am so done with survey sites because I get so frustrated when I am told int he middle of a survey that I no longer qualify and get paid nothing for my time. And most of them pay pennies for 1 hour of work. I had a feeling that this was going to be the same. I am looking for a real opportunity to make money online, not just some change, which is why I started my online website. Hey there thanks for stopping by – well, sure, starting your own website is a good idea. If you’re just starting out with that, this post may be helpful. Most survey sights are really frustrating – I think Field Agent does offer something different, but only if you’re in the right area, where there are actually tasks available.